GTA chief and the Gorkha Janmukti Morcha president Bimal Gurung and his team met Hon'ble Home Minister, Shri Rajnath Singh to discuss about the Gorkhaland demand. 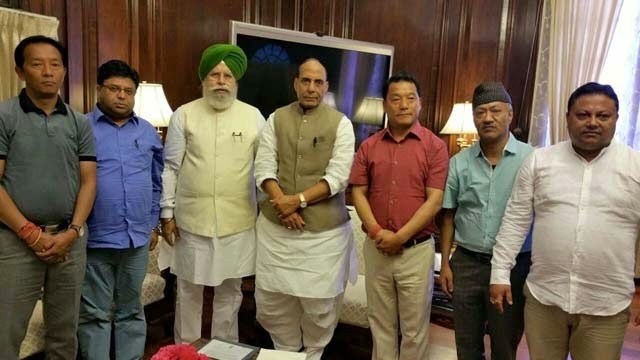 "A 7 member delegation led by me along with Hon'ble Member of Parliament, Shri S.S Ahulwalia, Roshan Giri, Binoy Tamang, Anit Thapa, Dr Harkha Bhadur Chettri and Arun Sigchi met the Hon'ble Home Minister, Shri Rajnath Singh and briefed about the century old demand of the Gorkhas. The meeting lasted for 30 minutes. The Hon'ble Home Minister has assured the delegation that he would talk to the Hon'ble Prime Minister, Shri Narendra Modi and Hon'ble President of BJP, Shri Amit Shah regarding to expedite the formation of a committee to examine our demand for Gorkhaland. The Gorkha Janmukti Morcha also raised the issue of non issuance of Gorkha Certificate to Gorkhas living outside GTA area. We requested the Hon'ble Home Minister that Gorkhas living across India must be give Gorkha Certificates. I am happy to say that the Hon'ble Home Minister has assured the GJM delegation that he would send circulars to all Administrative offices regarding issuing Gorkha Certificate to the entire Gorkha Community living across India. The Hon'ble Home Minister has assured that regarding the inclusion of the 10 Gorkha Communities in the Schedule Tribe List will be taken up with the RGI and The Ministry of Tribal Affairs."